I found a new series to put in my current list of top "favorites". I had to read the fourth book in the series recently, Stranger Room, and I discovered Frederick Ramsay's Sheriff Ike Schwartz mysteries. Then I went back to start at the beginning. After reading Artscape, the first book, I knew I had found an author who writes meaty crime novels with solid, interesting characters. Summer in southwest Virginia looked like it would be just more of the ordinary crimes in a small county for Sheriff Ike Schwartz and his department, until the board of trustees met for the Dillon Collection South. Callend College, the local women's college in Picketsville, housed an art collection worth half a billion dollars. When the board voted to move the collection within three weeks, they set off a chain reaction. A mysterious group planned to steal the collection in July, and hold it for ransom. Now, their plans had to be moved up. Only a former FBI agent, skilled in security, would be able to help them. Once they put the right pressure on him, the theft could move forward smoothly. But, no one counted on a security guard who liked to watch young people in Lovers' Lane. And, the thieves didn't count on a car parked in Lovers' Lane. When Sheriff Ike Schwartz finally had a chance to take inventory, he realized he had "Contract professionals, murder, possible kidnapping, possible Mafia, a rogue FBI man, and not a clue why the job was done." Oh, and of course that didn't include the art theft, or the college president, Ruth Harris, a woman who disliked Ike on sight. Ramsay's small-town sheriff is a man with depth, and a secret past. The author is as skilled at revealing Ike's secrets as Schwartz is at his job. It's going to be a pleasure to return to Ike Schwartz' community in the two books I haven't read. And, fortunately, there's another book due out in June, Choker. I'll be caught up by that time, waiting for the next outstanding book in this mystery series. Artscape by Frederick Ramsay. Poisoned Pen Press, ©2004. ISBN 9781590581223 (hardcover), 260p. I'm going to put these on my list to read, Lesa. They sound great. I have one book by this author that I picked up in Scottsdale, IMPULSE. I think it must be a stand alone. Impulse is a standalone, Kay. It sounds good, too, but I'm going to wait until I finish the series to read it. I love Ike, the main character here. 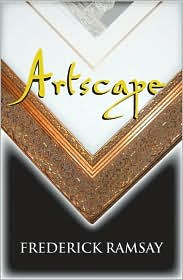 Start with Artscape. It helps to have Ike's background, and this isn't a weak debut mystery.